I’m a new mom to a 3-month-old baby. My husband got upset at me and when I answered back because he was being rude and name calling, he shoved me to the ground in front of our infant son! This is not the first time he has been physical with me. I got up and tried to fight back but he just pinned me to the wall. I’m fed up. I’m glad you’re reaching out about this. The verbal and physical abuse you’re describing is not okay. More to the point, from what you’ve shared, you and your baby are in danger. This can be hard to see when the abuser is someone you care about…and who says he cares about you. However, it’s not only about you and your baby’s immediate safety but also the long-term damage that exposure to this violence can take. What people working in behavioral health and domestic violence have learned over time is that, once there is violence in the home, it is likely to continue and worsen. We’ve also come to understand that witnessing violence in the home (even at a very early age) can result in long-term mental health problems. It’s really beyond the scope of this blog format to go into depth about this, especially since this feels more like an immediate crisis. The good news is that there is excellent help in this area available to you. Of course, if you’re in immediate danger, call 911 immediately. 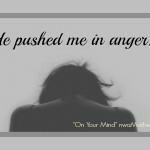 On Your Mind: A mom’s mid-life crisis? Marathon Mama: Is a GPS watch worth the investment?